Teacher’s Comments: Doesn’t poke you in the leg. 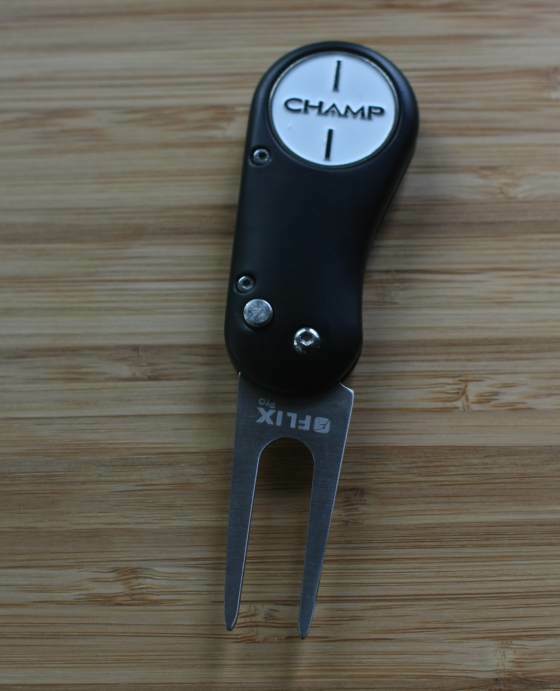 Champ Golf’s FLIX is a nicely designed switchblade style divot tool. The handle has rounded edges that fit the hand nicely and for some reason puts me in mind of a bean. I really prefer the switchblade style tools over other models because they prevent me from sticking myself in the leg. Another nice part of the Champ design is that the indentation for the ball marker is a standard size. I’ve run across a couple of other switchblade tools that use proprietary sizes. I guess I am going to need to surrender. The term “divot” has become synonymous with pitch mark and ball mark whether I like it or not. For us old fuss budgets, someone saying they fixed a divot on the green creates the image of a large hole gouged out of the green by someone playing an iron shot. Sigh, the English language marches on. I have given up. At this point, I try to use both. I identified it as a ball mark tool in the photo, and a divot tool in the text. The problem when trying to write for a more general audience is that so many have no idea what a ball mark repair tool is.